Serving as one of the cornerstones of good health, sufficient levels Vitamin B12 aid in several different systems throughout the body. Vitamin B-12 (Cyanocobalamin) is a water soluble vitamin necessary for the maintenance of a healthy nervous system and for the metabolic utilization of fats and proteins. Vitamin B-12 is also essential for the synthesis of DNA during cell division and therefore essential for the synthesis of DNA during cell division and therefore is especially important for rapidly multiplying cells, such as blood cells. In addition, adequate intake of Vitamin B-12, along with Folic Acid and Vitamin B-6, encourages healthy serum homocysteine levels, thereby supporting cardiovascular health. Because Vitamin B-12 is found predominantly in animal products, strict vegetarians are at risk of developing Vitamin B-12 deficiency and may benefit from supplementation. 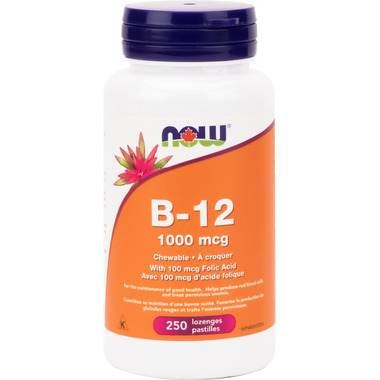 NOW® Vitamin B-12 is vegetarian/vegan (non-animal derived). NOW® B12 Lozenges also contain 100 mcg of folic acid to boost red blood cell production. These natural fruit flavoured Lozenges can be chewed or used sublingually under the tongue. great for reviving and mental work such as studying...never without it! I highly recommend this product--I constantly have canker sores, but this product eliminates them for me! Must have been in a daze when I ordered this product. Containing both sorbitol and fructose, the latter of which is not at all healthy, I would not recommend this product to anyone. Completely defeats the purpose of ingesting a supplement when it comes packaged with unhealthy and unnecessary ingredients.